Performances will be on Friday, November 21st and Saturday, November 22nd at 6:00pm at Owego United Methodist Church. Owego New York. Tickets will be $15 each in advance. Tickets will go on sale Sunday, November 5th. 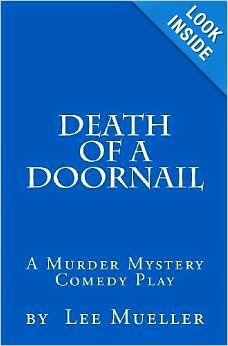 This year we will be presenting a hilarious comedy entitled "Death of a Doornail" by Lee Mueller. Eccentric Millionaire, Albert Doornale has invited all of his close friends to his estate; including his ex-wife Abigail, his current fiance Candy Bombay, and his childhood friend from the lower East Side, Salvatore Carbone. Everyone arrives at the estate greeted by the grumpy butler, Mortimer and cutlery carrying cook, Mrs. Morganford. The only problem is, Albert is not there, no one has seen him. Not his nerdy nephew Edward or his socially spoiled daughter, Pricilla. None of the guests have any idea why they are there or what happened to their host. That is until blood is found in the upstairs bathroom. Was Albert killed and carried away? In the nick of time, Inspector Bukowski arrives on the scene. A murder investigation will begin, as soon as a body is found. It may be a long wait! If you haven't you don't want to miss this one. Bring your friends and enjoy a night of fun, food, and fellowship. For more information contact the church office at 607-687-2417.